The swimming pool: It's summer fun for kids and adults alike. If you're planning to bask in the sun and splash around in a pool to beat the heat, consider these tips to keep your family safe. Swimming pool accidents happen all too often, and all too often they are avoidable. The personal injury attorneys at Edgar Snyder & Associates know just how devastating these swimming pool accidents can be so we compiled a list of swimming pool safety tips. You'll be armed with knowledge this summer, in addition to the obligatory sunscreen and beach towels. Everyone's heard the old saying: It's better to be safe than sorry. And there's a reason why people have been repeating the phrase for generations. Statistics show thousands of people are injured or drown in pool-related accidents every year, so pool owners especially need to heed this advice and consider creating a pool safety kit as recommended by the U.S. Consumer Product Safety Commission. Never allow children to swim in a pool without adult supervision—ever— even if they know how to swim. And regardless of whether you're at a private or public pool. If a child is missing, always check the swimming pool or hot tub areas first. 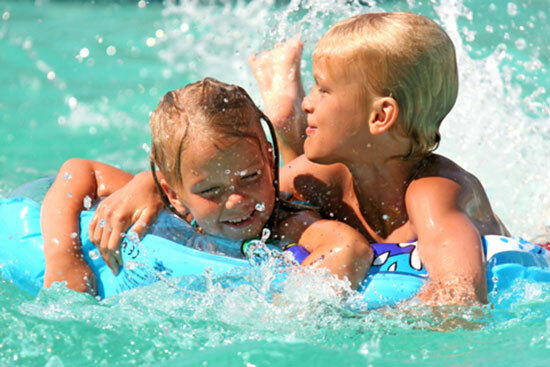 Keep children away from areas of the pool where an injury is most likely (think drains, pipes and skimmers). Not only should you learn CPR, but you should also insist that the other people who care for your child do, too. This means grandparents, babysitters, aunts and uncles. Getting certified is easier than ever, with many local organizations such as the YMCA offering certification courses that are both flexible and cost-effective. When it comes to treating a swimmer who has been injured or who has almost drowned, every second counts. In case of an emergency, be sure to have CPR instructions and the numbers for emergency officials posted near the pool. Consider enrolling children who are not pool-savvy into a beginner swim course. Enclose your swimming pool on all sides with a self-locking, self-closing fence with vertical bars. Just as a note: Openings in the fence should be no more than 4 inches wide. Never leave furniture near the pool fence that could make climbing over it a possibility. Put away pool toys when they aren't being used (they can attract children to the water). Always completely remove pool covers before swimming, and then completely and correctly secure them again when you're done or when the pool is no longer in use. Avoid general horseplay (this means no running!) near pool areas. You know that list of rules posted by the public swimming pool? Follow them—and only swim when there is a lifeguard is on duty.